Are you interested to visit one place with mixed Malay, Chinese, Indian, and European Culture? If yes then I will recommend you to plan your trip immediately to Malaysia. The summer is arriving and vacation for kids is near they will definitely expect to visit the most famous and lovely place in the world. And you may be thinking of planning for such a wonderful trip at your budget. 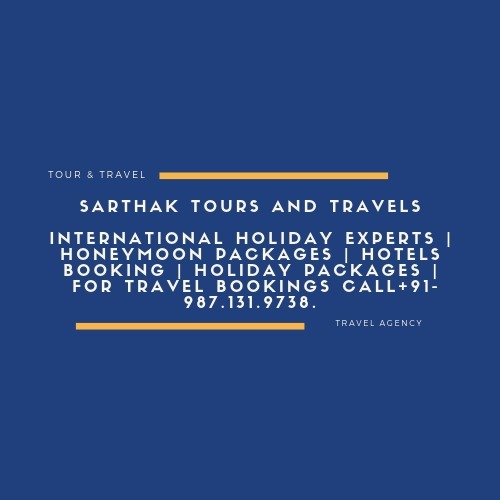 We at Sarthak Tours and Travels present you plenty of packages at the most economical price with plenty of offers by booking earlier. We would like to share few things about Malaysia before planning your trip so that you may feel easier to pick the package. Location: It is situated in Southeast Asia which occupies the parts of Malay Peninsula and the island of Borneo. Capital of Malaysia: Kuala Lumpur is the capital of Malay which is the home for various colonial buildings, busy shopping places, and several iconic and artistic places. Holidays in Malay: Famous in Malaysia is the celebration of various festivals and events. Malaysia is filled with colors, exciting activities and much more fun whole year. Climate: December to February and June to September are the peak travel season. Rainy or monsoon season starts from November to March. Best time to have fun in Malaysia is during the celebration of Chinese New Year, Hari Raya Puasa, and Ramadan. Malaysia is one of the places which have plenty of destinations to have fun with family, kids, and friends and with your loved one. Here we have listed some of the hotspots separately in different categories. You can select the places as per your status and wish. The places in Malaysia welcome you with lot of love and craziness. It is the Malaysian peninsula island in Southeast Asia which has several colonial landmarks like Fort Cornwallis, Chinese Clan Temple Khoo Kongsi and the Indian style Kapitan Keling Mosque. It is the capital which has the 451 meters high tall Petronas Twin Towers, a pair of glass and steel clad skyscrapers with Islamic motifs to know the city’s modern nature. It is the place to get all things like food, shopping, culture, transportation, entertainment, arts, resorts, and much more. It has indoor theme park at Berjaya Time Square and plenty of street food shops to have much fun in the trip. George Town is the capital of Penang which is the most famous trade centre of British colonies. It is the city filled with artistic building, historical enchanting, skyscrapers arise high throughout the city. It is the enchanted place in the shape of dragon which has the story of dragon princess resting in this place on the way to visit prince. The island is filled with jungles, massive mountains, exotic colorful marine life, peaceful beaches, and plenty of secluded private places to enjoy the privacy with your love. Water sports like Kayaking, Surfing, Jet skiing, Diving, etc can be done here along with the view of beautiful scenery of Asah waterfalls and can trek via the lush rainforest. Redang with soft white sand, corals and fishes through crystal clear turquoise water and the greenery jungles surrounding the water makes you feel you are in paradise. It is the largest island in Malaysia and the perfect place for couples to spend their time without any interruptions. Watch the sea turtles, go for island hopping, and wind surfing and hike through jungles. Play volleyball in the sand to refresh you up. Malacca– It is the historical city for relaxing, shopping, eating and sightseeing the old and traditional places. Cameron Highlands– If you are searching for the coolest place in Malaysia this would be better choice. It has the breathtaking view of tea plantation, lush green hills, strawberry farm, and few cottages to stay relaxed. Asia’s largest artificial lake has waterfall excursions to fishing. This is the place to have adventurous fun with our besties. Rainbow Waterfall– Sight of rainbow falling on the waterfall is one of the awe inspiring things in the natural world. Endau Rompin National Park is the park which shows what Malaysia is real about where rich rainforest and wildlife can be accessed. Legoland– It is one of the place which gives pride and joy for Malaysia. It is the non natural destination where you can spend your day with friend to make plenty of memories. Selangor- It is one of the botanical adventure parks which have high attractions for nature and adventure seekers with different circuits for adults and kids. Melaka– It is the wonderland theme park with various rides, Adventure Island, big wave pool, Tornado Chaser, etc. Perak– Park with various zones like amusement park, petting zoo, tin valley, water park, tiger valley where you can do activities like White water rafting, caving, tubing, etc. If we are giving the list then the list will go without any end as it has plenty of places to visit. And we at Sarthak Tours and Travels have picked up the loveliest places to save your effort and time and made it as package. You work here is to just pick the package at your budget and interest. If you are interested call us @ Phone: 91-9871319738, Landline number: +91-0120-4154760.